Despite how hard you try to tune out political news, you've probably heard by now that the federal government is partially closed and a lot of people with important jobs are working without getting paid. Among those currently without pay are federal employees like traffic controllers, inspectors, and Transportation Safety Administration agents -- you know, the folks responsible for keeping airports and airplanes safe? Due to the shutdown, many TSA agents are choosing to opt out of work in favor of a sick day. And who could blame them? You probably wouldn’t be at work right now if your boss (or, you know, the president) withheld your paycheck. Michael Bilello, the TSA’s Assistant Administrator of Public Affairs, confirmed that year-over-year “call outs” increased from 3.8% daily to 4.6% so far during the shutdown, which as a report by Forbes points out, is about a 21% increase overall. To date, “call outs” nationwide are having minimal impact. Jan 7, 2019 “call outs” are 4.6% vs 3.8% on Jan 7, 2018. Security standards will NOT be compromised. The TSA currently employs around 47,000 people, according to Forbes, which means hundreds are skipping out on work as the government shutdown drags into its third week. 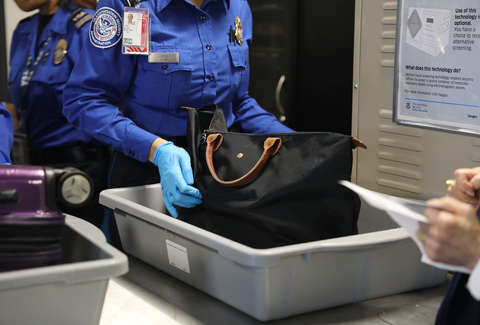 It’s gotten so bad that senior TSA officials have reportedly dubbed the mass call outs the “blue flu,” a nod to the color of TSA uniforms. Their absence has led to longer lines at airports, like New York’s LaGuardia, Seattle Tacoma, and others across the United States. A TSA union official told CNN some employees found that coming into work simply didn’t make sense financially. Factoring in costs of commuting and, in some cases, child care, it cost more for them to show up than eat up their sick time. The financial strain forced some to use their time off to take temporary jobs just to make ends meet, which is devastating to say the least. Despite fewer Transportation Security Officers (TSOs) coming into work each day, the TSA maintains that it’s committed to upholding security standards. Bilello said on Twitter that “99.9 percent of passengers waited less than 30 minutes,” and “92.9 percent of passengers less than 15 minutes” at all US airports on Monday. LaGuardia, he said, averaged just 17 minutes to get through security on Monday. Other busy airports, like Dallas-Fort Worth and Chicago O’Hare, boasted similar figures at 20 minutes and 11 minutes respectively to complete security checks. While it’s clear the organization is operating efficiently even while short-staffed, the frustration among TSA agents who are showing up to work is evident. One Twitter user recounted an encounter with a TSO, who joked with the airline passenger about her lack of income during the shutdown. Senior officials within the TSA are working with its regional leaders to provide incentives for employees that agree to work during the shutdown. Because nothing boosts morale like a good old fashioned bribe. Some airports have started granting future time off. Despite the livelihoods of federal workers being on the line, President Donald Trump has threatened to keep the government shuttered for “months or even years” over his demands for $5 billion to fund his border wall (or is it a fence now?). Trump has even alleged that federal workers are cool with the lack of income, but the sheer number of TSA agents calling out of work clearly says otherwise. Hang in there, federal employees.